President Donald Trump spoke at the White House last week. WASHINGTON — President Donald Trump pushed back on Wednesday against his intelligence chiefs’ national security assessments, saying that “the Intelligence people seem to be extremely passive and naive when it comes to the dangers of Iran,” and defended his own, more positive appraisals of the threats North Korea and the Islamic State pose to the United States. “Perhaps Intelligence should go back to school,” Trump said on Twitter. In a series of posts the day after senior U.S. intelligence officials briefed Congress and directly contradicted some of Trump’s rosier estimations, the president reasserted his own conclusions and trumpeted his accomplishments on critical national security matters. He said the Islamic State’s control in parts of Iraq and Syria “will soon be destroyed” and there was a “decent chance of Denuclearization” in North Korea. On Tuesday, top intelligence officials described a different Iran than the president has, one that is not currently trying to make a nuclear bomb and appears to be complying with a 2015 nuclear agreement, even after Trump promised last year to withdraw from it. On Syria, intelligence officials said the Islamic State would go on “to stoke violence” with thousands of fighters there and in Iraq, and with 12 networks around the world. They also said North Korea was not likely to permanently shed its nuclear weapons — contradicting a prediction Trump has made based on what he has called the “best” relationship the two nations have ever had. The divergent views of a president and his intelligence agencies may diminish trust from the public and from American allies about U.S. foreign policy goals. The disparities could also discourage Americans from working in the intelligence field. “People risk their lives for the intelligence he just tosses aside on Twitter,” Sen. Mark Warner of Virginia, the top Democrat on the Senate Intelligence Committee, said of Trump on Wednesday. Rep. Adam B. Schiff, D-Calif., chairman of the House Intelligence Committee, said it was dangerous for the president to dismiss the findings of his own intelligence agencies. Tuesday’s testimony was linked to the release of the annual “Worldwide Threat Assessment,” a report to Congress that ranks threats to U.S. national security from around the world and provides the public with an unclassified and up-to-date summary of the most pressing threats. Dan Coats, the director of national intelligence, had told lawmakers that North Korea’s leaders “ultimately view nuclear weapons as critical to regime survival.” He said there was “some activity that is inconsistent with full denuclearization” in the country and that most of what it had dismantled was reversible. Trump is expected to meet with North Korea’s leader, Kim Jong Un, next month. 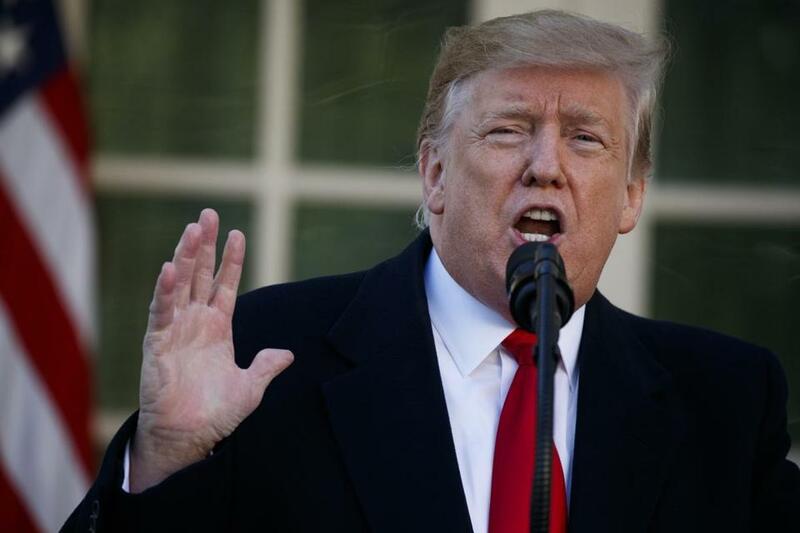 Trump announced in December a plan to withdraw U.S. troops from Syria after concluding “we have won” against the Islamic State. Prominent members of his own party have denounced what Sen. Mitch McConnell of Kentucky, the majority leader, on Tuesday called “a precipitous withdrawal” of U.S. troops from Syria and Afghanistan. While it is unusual for a president to pick a fight with his intelligence chiefs, this is not the first time for Trump. After the 2016 election and before he took office in 2017, Trump was publicly skeptical of intelligence conclusions that Russia interfered in the 2016 presidential election, and he mocked intelligence agencies for their role in the lead-up to the Iraq War. Trump also contradicted last year’s global threat assessment from senior intelligence officials, whom he had appointed to his administration. While his top intelligence officials warned about Russia’s continuing efforts to conduct influence operations, Trump continued to dismiss any notion that Russia had interfered in American elections. Douglas H. Wise, a career CIA official and former top deputy at the Defense Intelligence Agency, said Trump’s criticism of the intelligence chiefs threatened to corrupt the process. Intelligence officers do not like to be at odds with the president, he said, and Trump’s comments put them in an uncomfortable position.